Crabtree Falls is a 70 foot cascade on Big Crabtree Creek, a short hike from the Blue Ridge Parkway. The creek drops over a black rock face with many small ledges, giving it a delicate web-like appearance. A trail descends 500 feet over the course of a mile as it leads to a footbridge crossing the creek at the base of the falls. In the Spring, an impressive array of wildflowers can be found, and by July ferns fill the dense hardwood forest and soak in the spray of the falls. You can complete a loop hike by continuing through the forest beyond the waterfall an additional two miles. I’ve known about Crabtree Falls for some time and finally ventured there on Tuesday, July 21, 2015. I started hiking at 11:45AM and finished about 2:30PM. My plan was to take the loop through the Crabtree Meadows campground down to the falls and back up the other side. Hike Rating: Moderately strenuous at times on the ascent. Trail Condition: The upper portions of the trail are notably nice and well groomed. As it gets deeper into the gorge it becomes rockier with exposed roots and slipping hazards. If you venture off the footbridge at the base of the falls, the area around the waterfall is always wet and extremely slippery. Starting Point: Parking area alongside the former visitor center for Crabtree Falls. Trail Traffic: This is a very popular attraction on the Blue Ridge Parkway. I encountered about two dozen others on my descent to Crabtree Falls, but didn’t see anyone else as I continued the loop beyond the falls. How to Get There: Mile 339.5 on the Blue Ridge Parkway. There is enough parking for at least 50 cars. The drive up into the mountains north from Asheville along the crest, past Craggy Gardens and on to Mt. 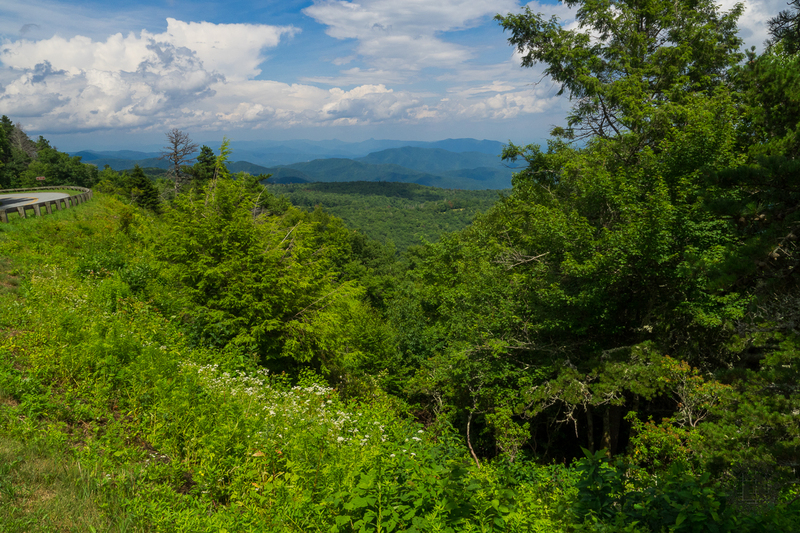 Mitchell and beyond, is perhaps the most scenic area of the Blue Ridge Parkway in all of the Southern Appalachians. Unfortunately, as is all so common, on this morning it was mostly socked in fog above 5,000 feet, so I was hoping for clearing by the time I finished hiking at Crabtree Falls. 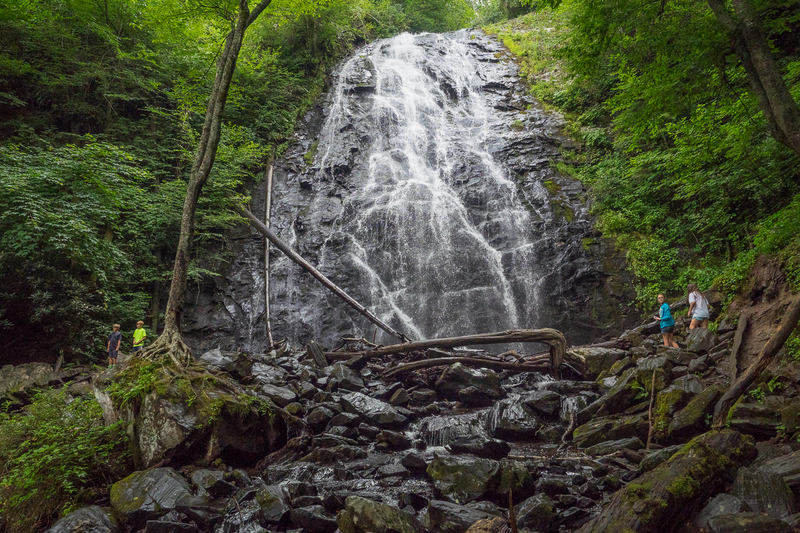 The Crabtree Falls area at mile 339.5 on the Parkway used to be one of the most popular in the high country. It still is beloved, but budget cuts in the Park Service have necessitated closing the visitor center. The campground is still open, but it looked to me like only about 20% of the campsites were being used. There are two trailheads for the hike to Crabtree Falls. The first (and the one you should use) is on the east side of the former visitor center parking area. It is paved for about 500 feet, walks past an amphitheater, changes to crushed stone and passes through a delightful mountain meadow that was beaming with wildflowers on this mid-July day. I was treated to black eyed susans, phlox, monarda, daisies and lilies. On the far side of the meadow is Loop A of the campground. Here you cross the campground road to another smaller parking area that used to be the hiker’s lot for the 2nd trailhead. Notice I said used to be. There are now barriers blocking this parking lot, so you need to park back at the visitor center. Not a problem. The extra half mile was actually a nice warmup, and the flowers were delightful. From the 2nd trailhead in the campground it is one mile to Crabtree Falls. The first half of that mile is on a wide forested pathway that descends gently to a meeting with the loop trail. It is luscious green forest, quite dark too, with a dense overhead canopy. It’s the second half of that mile where you really need to begin paying attention. The trail gets considerably steeper, even having to resort to twisty slate stairways, and there are more exposed roots and rocks for you to slip or trip on. There are three distinct sets of these stairways that ease the steepness of the descent. The pace of the procession down into the gorge began to slow as those who started ahead of me were creeping now. Navigating the stairs, the crooked roots, and the damp slippery stones isn’t anything to rush through. It was about this time that I noticed that telltale sound of rushing water. It’s always exciting to me. It means there is whitewater ahead. A large family group waved me past, enabling me to later have about three minutes alone at Crabtree Falls. You really can’t see much of Crabtree Falls as you approach, but you can sure hear it. The forest is so lush in July that you can’t view the waterfall until you are right upon it. There is a footbridge across Big Crabtree Creek perhaps 30 feet long that offers your initial view of this very picturesque waterfall. There is also a bench on the bridge that came in handy as I changed camera lens filters. I managed to get off a few photos before the crowd arrived. Crabtree Falls plunges 70 feet into a small basin. It falls over layer upon layer of textured black stone ledges that create hundreds of web-like tentacles of water all along the way. Unlike many waterfalls, this one isn’t conducive to swimming. It continues to fall over wet gnarly rocks even after splashing at the bottom. Once you get off the bridge to explore, it is very, very, very slippery here. It is also cool here, and damp. There is a mist in the air from the falls and everything that surrounds it is wet. Did I mention how slippery it is? I found a nice flat boulder on the right side of the waterfall that was kinda out of the way of everyone arriving at the footbridge. I spent probably an hour there… eating lunch, people watching, and simply reveling in the beautiful scene. It was fun to watch the kids trying to climb to the base of the falls. Kids are resilient. The number of slips and falls I saw them take would have hobbled me for a month. Believe me, when I was walking around on the wet mossy stones looking for photo ops, I was moving at a snail’s pace. The boys on the left of this shot fell umpteen times. The girls on the right fared a lot better. As more and more people continued to come and go, it became apparent to me that I wasn’t going to get anymore alone time with the waterfall, so it was time to pack up and climb the other side. The loop trail continues beyond the falls. 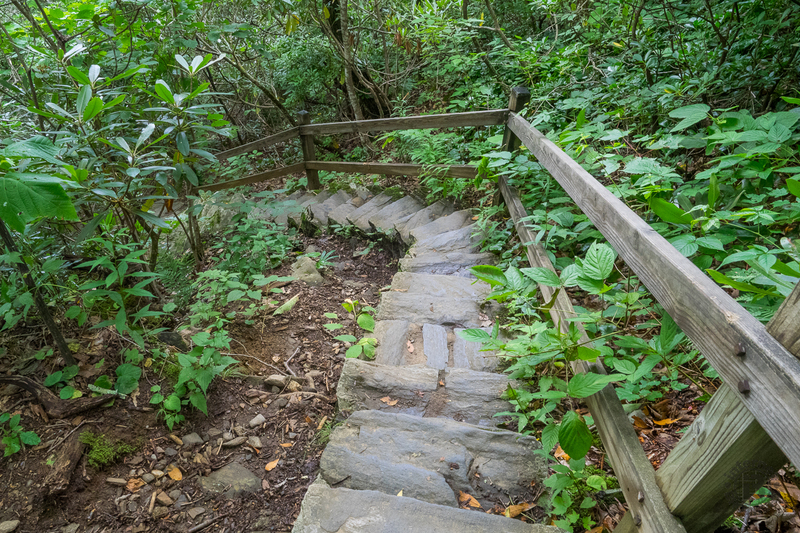 It starts out with more of the slate stairs to take you to the level of the top of the falls, and then arcs through a series of tight switchbacks as it gains most of the 500 feet back in a short half mile. It’s the hardest part of this hike. By now I was panting pretty good. Add to that an afternoon shower. I scrambled to pull the rain gear out of my pack, and managed to stay mostly dry… at first. That didn’t last long though, as I got wet from the inside. With the on again, off again, on again showers the rest of the way, the forest got very steamy. My rain jacket and pants acted like a sauna. Sometimes you’re just going to get wet no matter what. At the top of the ascent is a well-positioned rocky outcrop with a splendid view of the Black Mountains in the distance. You can hear the rush of Crabtree Falls below. The good news was, despite the rain, the fog was lifting. Perhaps I would actually be able to see something along the Blue Ridge Parkway on my ride back home. Roughly a mile and a half after Crabtree Falls you have a choice. You can continue on the trail back to the loop junction, or you can pass through campground Loop B to get back to the beginning. I chose the former. The last stretch of the trail is more of that groomed pathway that is very easy to walk on. When I got back to my car I was pretty wet, inside my rain togs. Fortunately, I had prepared for this. Anticipating a possible shower, I brought a change of dry clothes with me. That was a big help. More good news was that I could actually see some blue sky now, and puffy white clouds rather than fog. Perhaps I could get some nice pictures along the crest of the Parkway on the return trip. Like this one from Curtis Valley Overlook. Summarizing the Crabtree Falls hike, I’m definitely glad I finally took the time to check out this picturesque waterfall. I would describe it as one of the more scenic in Western North Carolina. The hike itself is mostly family friendly. I say mostly because you might want to leave the kids home who are younger than, let’s say, six. It would be too much for toddlers. It’s a three season hike: Spring, Summer, and Fall. It would be nice to see the falls in Winter. Unfortunately the Parkway isn’t open. When I was hanging around the waterfall there were probably 15-20 other people there too. What I noticed in the time I was there, and later, is that I appeared to be the only one who continued on around the loop. Everyone else seemed to go back up the way they came down. I recommend you take the loop. That way you won’t miss the outcrop that overlooks the Black Mountains, or the path along Big Crabtree Creek and an occasional old growth tree. Plus, it’s great exercise. Combine this hike with the particularly stunning stretch of the Blue Ridge Parkway and you will have a most remarkable day. And isn’t that what it’s all about?